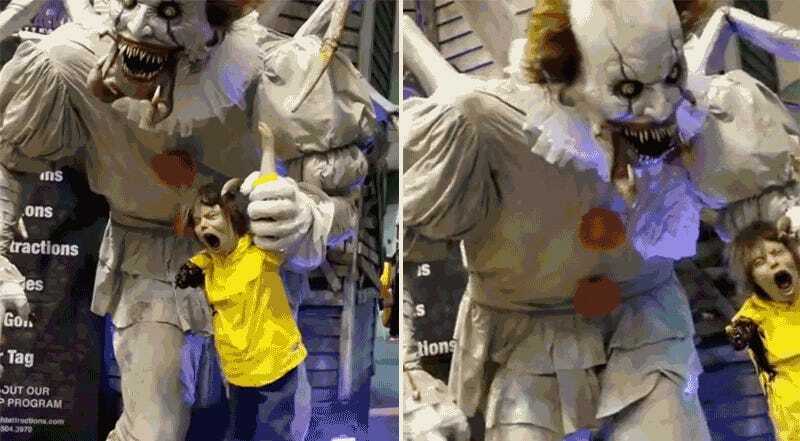 The TransWorld Halloween & Attractions trade show is going on in St. Louis right now, and if for some reason you thought last year’s It remake wasn’t terrifying enough, come Halloween you can put this demonic, animatronic Pennywise clown on your front lawn, which includes a screaming, one-armed version of Georgie in its clutches. The prop was being demonstrated by Unit 70 Studios at the show, who are responsible for many of the terrifying animatronic creatures you encounter in a haunted house attraction. If this becomes available, anyone willing to spend tens of thousands of dollars for it can rest assured at least they won’t also just have to buy a hundred dollars worth of candy to give away, because trick-or-treaters aren’t going to come within five blocks of any house that has this on its front lawn.